As a hospitality pro, we know the last thing you want are unhappy customers who have trouble sleeping while they are your guests. 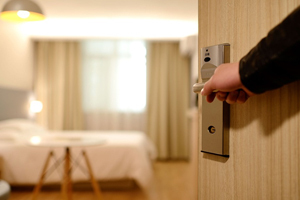 Making your guests comfortable when they are trying to sleep in an unfamiliar environment with the inevitable little noises that are unavoidable, always presents a challenge for you and your staff. Fortunately we have a wide range of solutions you can offer your guests to help them sleep better. Disposable foam ear plugs. Foam ear plugs are the most effective at blocking noise when properly inserted, however many of your guests will not find them satisfactory, since foam ear plugs require considerable skill to get them properly inserted. It is also difficult to predict what size of foam ear plug each visitor will need to use them comfortably all night. Silicone Putty or Wax ear plugs. Moldable silicone or wax ear plugs fit everyone perfectly every time, can be used by children and adults alike, require no experience or knowledge to use, and are always comfortable to sleep with, because they mold to the ear as needed by simply lying on them. Of the two, silicone putty ear plugs offer several benefits over wax including lower cost and easier use. Wax plugs must be kneaded to soften them before insertion. This is not needed for silicone putty ear plugs. The benefits of wax ear plugs is slightly better noise reduction, and they are a little more comfortable because they soften with body heat to virtually eliminate any pressure after wearing them for just a few minutes. White noise machines. One of the very best strategies for helping guests sleep well is to provide a desktop white noise machine in every room, or make them available as needed by guests who complain about noise. Some guests will object to using a masking sound, because it is an unfamiliar concept to them. We suggest that you keep a few on hand for sale to your guests, because after using a white noise machine to sleep with, some of them will want to take one home. The experience can be transformational for some! Let us custom imprint ear plugs with your logo. We know your image is important, and we offer custom imprint options to help you maintain the professional image you have worked so hard to perfect.